A principal leader of the Protestant movement from the mid-1520s on, Landgrave Philipp of Hesse (1504-67) founded the world’s first Protestant university in Marburg in 1527. In 1529, in the hope of unifying the Protestant movement, he convened the Marburg Colloquy. 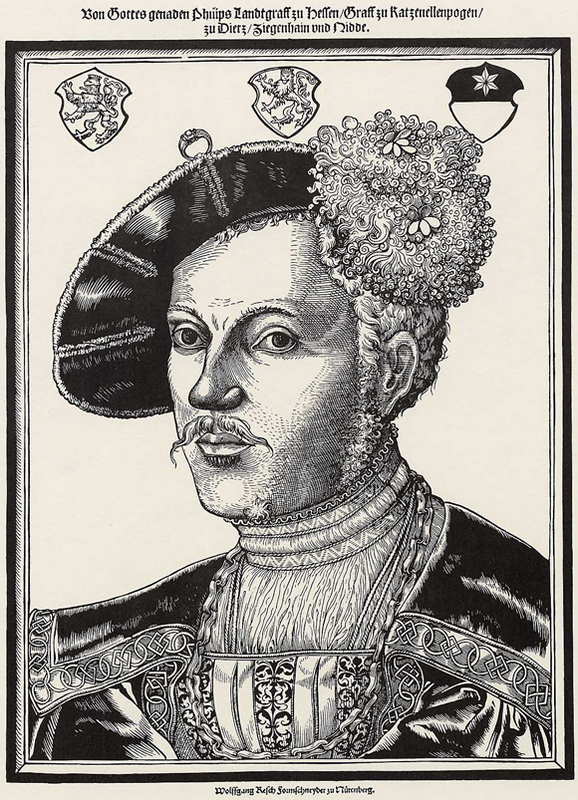 From 1531 to 1547 he was one of two commanders of the Protestant defensive alliance known as the Schmalkaldic League, and he played a notable role in the Imperial politics of the era. After his bigamy created a scandal, he was forced to make major concessions to Emperor Charles V in order to avoid the death penalty. Woodcut by Hans Brosamer (c. 1500-52), 1535.